Just eight months after Sony introduced the a6300, a higher-end sister model to the a6000, we now have another higher-end sister model in the a6500. The sheer speed of Sony’s product releases lately is somewhat appropriate, given the outright shooting speed these cameras are capable of. 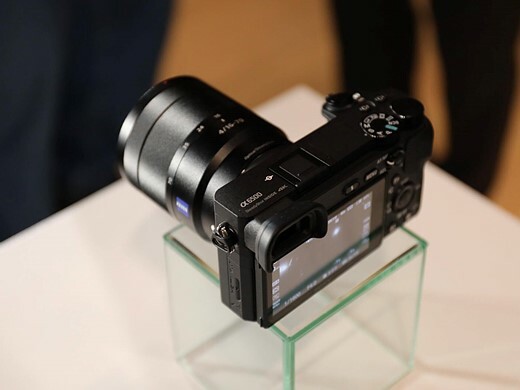 Both cameras feature the same 24MP APS-C CMOS sensor, the same 425-point on-sensor PDAF system, the same viewfinder, the same video specification, and the same 11 fps burst shooting rate (8 fps with Sony’s implementation of ‘live view’). Wait a second – what exactly is new to the a6500? Turns out, there’s a handful of changes that can have big implications for how photographers will interact with and use these cameras, but are they worth the $400 premium on the new model? Let’s take a look. Patrick Murphy-Racey discusses using the a6500 for peak action (like drag races) due to its burst speed and autofocus system. A deeper buffer combined with a newly developed front-end LSI (which stands for Large Scale Integration – it’s basically an additional chip providing more processing power) promise more responsive performance when shooting bursts – 300 JPEG or 107 Raw images can be captured at 11 fps with full autofocus and autoexposure. Users can also instantly review or check focus on the last image that the camera has written to the card (though that might not necessarily be the last image in that burst), with the added plus of an indicator showing just how many images remain to be written to the card. Comparatively, the a6300 can still shoot at 11 fps with full autofocus and autoexposure, but only for 44 JPEG or 21 Raws. And while the camera is writing to the card, you can’t enter playback, or magnify the displayed image (if you have image review on). We’re particularly happy to see that last limitation go, as it makes the camera eminently more usable. Sony consolidated the shutter charge and shutter mechanisms to one side to make room for the IBIS unit in the a6500. 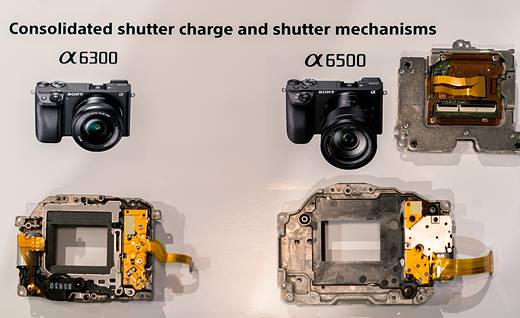 Without increasing the depth of the camera body, Sony has redesigned the a6500’s shutter mechanism to not only be more durable (tested – though not guaranteed – to 200,000 cycles), but also to incorporate 5-axis stabilization with non-stabilized lenses. What’s more, when you pair an optically stabilized lens with the a6500, the camera knows to pass of pitch and yaw correction to the lens’ stabilization system. This doesn’t increase the effectiveness more than the rated 5 stops, but is likely to help maintain effectiveness when shooting at longer focal lengths. There’s also the intriguing possibility of shooting full 4K stabilized video with any lens – but we’re withholding our verdict on the resulting image quality until we can test it for ourselves. After all, core video specification and performance hasn’t changed from the a6300 to the a6500, and we’re curious to see if the stabilization system has any effect on the rather lackluster rolling shutter performance of the a6300. And, of course, the a6300 offers no in-body stabilization. The a6500’s screen is touch-enabled, whereas the a6300’s isn’t. They share the same resolution (and the touch-panel doesn’t seem to have affected glare or fingerprint-resistance), but on the a6500, you can now use the screen to quickly place an AF point, move your AF point around by acting as a ‘touchpad’ with your eye to the finder, and also double-tap to zoom and swipe around an image in playback. 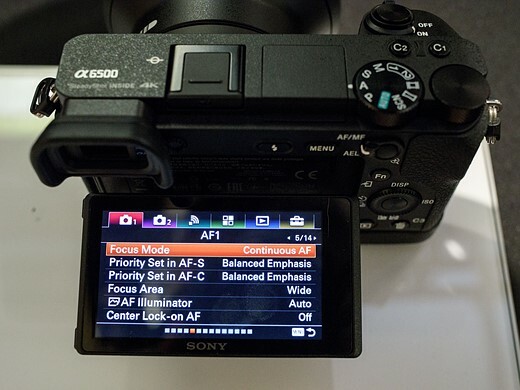 So while AF performance will likely remain the same on the a6500, you may now find you’re more quickly able to adapt to a scene in front of you by using the touchscreen as opposed to the cumbersome sequence of button presses most Sony cameras require for focus point movement. That said, in touchpad mode, the control of the AF point is unfortunately always relative, rather than (at least an option for) absolute, so you swipe to move the AF point from its current position, rather than touching exactly where you want it to be. This meant we found ourselves often swiping repeatedly to get the AF point from one side to the other. This could be obviated with absolute positioning in combination with limiting the touchpad area to the upper right quadrant, something we suggested to Sony in-person. Lastly, we found the touchpad performance to be decidedly laggy, especially when compared to competitors’ offerings. When it comes to video, the a6500’s touchscreen is particularly useful for focus pulls, since you can just tap to change the focus point and initiate a rack focus (and as always, you can control how quickly the camera will rack focus). 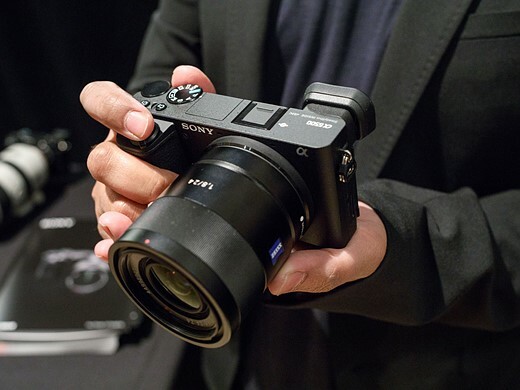 Less easy is getting the camera – in video – to continue to track your subject around the frame after you’ve tapped on it, since Lock-on AF is unavailable in video (something we continue to request Sony to address). There appears to be a workaround, though: if you turn the old, vesitigial ‘Center Lock-on AF’ on, then tapping appears to initiate subject tracking. Unfortunately, ‘Center Lock-on AF’ isn’t always the most reliable, and it’s still somewhat cumbersome to work this way as you have to first turn this feature on, which requires either a (Fn/main) menu dive or a dedicated button assigned to it, plus a couple more button presses before you tap. Autofocus and video options are among the new ‘groupings’ within the updated Sony menu system. Besides the touchscreen, the other major control change on the a6500 compared to the a6300 is the addition of C2 | C1 custom buttons on the top plate, a7-style. 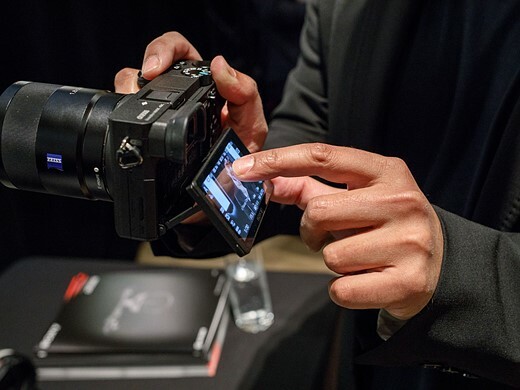 They’re nicer buttons than the soft-press C1 button of the a6300, providing more haptic feedback. The a6500’s grip has also been redesigned to be ‘chunkier’ and deeper than that on the a6300, again much like the a7 Mark II cameras, which should help when using heavier or longer lenses. The a6500 also inherits the redesigned menu interface that debuted in the a99 II which is, in our opinion, much more user-friendly than the interface on the a6300 (and a6000, for that matter). The tabs are now color-coded, but more importantly, similar functions like autofocus, image parameters and movie settings are grouped. This makes it much less likely that you’ll miss a moment while rocketing through the menu to find a setting you swear you saw somewhere in there last week. It’s one of our favorite additions to the a6500, and it’s about time. Unfortunately, you still can’t make a custom ‘My Menu’-like page in this menu system. A shame, as it’s an easy way to group most-used menu items into one section for quicker access, particularly ones – like movie options – that can’t be assigned to the custom Fn menu. There’s no question that the a6500 is incredibly well-specified camera in an impressively small package. 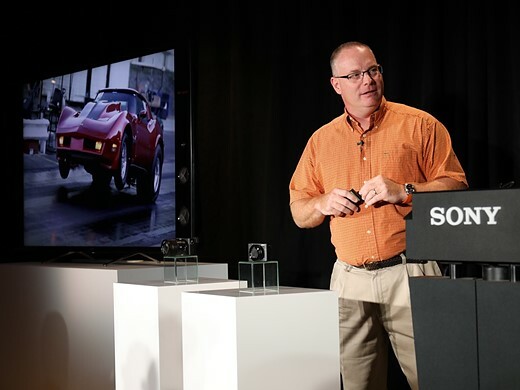 In terms of usability, Sony has made great strides on this new model with the addition of a touchscreen and a revamped menu system. Unfortunately, there’s still a few aspects of the a6500 that we can’t help but wish Sony would have addressed. Unfortunately, like the a6300, the a6500 lacks a control dial on the front of the camera – an omission that is all the more glaring at its higher position in the market. Unlike the a6300, all of the a6500’s direct peers offer twin control dials, and a front control dial would further aid usability in our opinion (though we’d also happily take the ‘Tri-Navi’ system of the old NEX-7 flagship as a compromise). The core stills and video specification hasn’t changed at all since the a6300 (although the new front-end LSI is supposed to help with JPEG performance at higher ISO values). Now, the a6300 already produced great results under almost any circumstances with one big exception – rolling shutter in 4K. While the detail level is impressive and the capture aids are extensive (S-Log, zebra patterning, focus peaking, etc. ), we would really have liked to see Sony address the rolling shutter issue in this new model. And a headphone monitoring port wouldn’t hurt, either. Limited battery life is a problem endemic to mirrorless cameras as a whole, and the a6000-series is no exception. Still, probably thanks to the additional processing and touch-screen, the a6500’s battery life rating has actually decreased compared to the a6300 by over 10%. It goes without saying that’s a change in the opposite direction than we would like. The a6500’s additions over the a6300 are small in number, but potentially huge for what they offer users. Sure, the new model comes at a $400 premium over its mid-range sibling, but the upgrades in the new flagship model have the potential to be significant. Of course, whether they’re significant to you depends on whether they line up with what you like to shoot. If you don’t shoot long bursts, or don’t find yourself checking focus all that often, the additional buffer performance isn’t likely to matter. If you shoot a lot of video and want more flexibility with lens choice, the in-body stabilization is likely to be very helpful. One thing that we feel will positively impact all users – even those who primarily use the viewfinder – is the touchscreen. That said, its laggy behavior is disappointing considering just how much processing power this camera has. We generally feel that, given the sheer capability of this camera, the price premium over the a6300 is warranted. 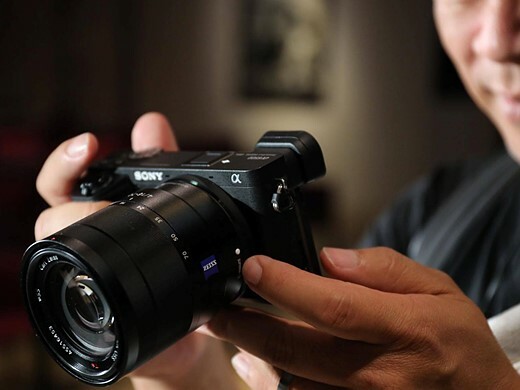 The Sony a6500 represents a lot of camera in a very lightweight package, and it’s encouraging to see that Sony is continuing to refine its APS-C offerings.